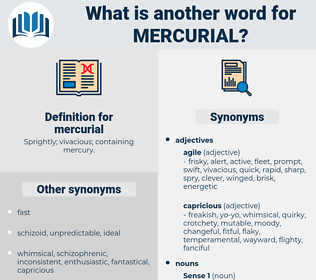 What is another word for mercurial? steady, steadfast, staid, dependable, sensible, constant. changeless, certain, reliable, fixed, undeviating, stable, lasting, sure. predictable, consistent, unchanging, regular, definite. 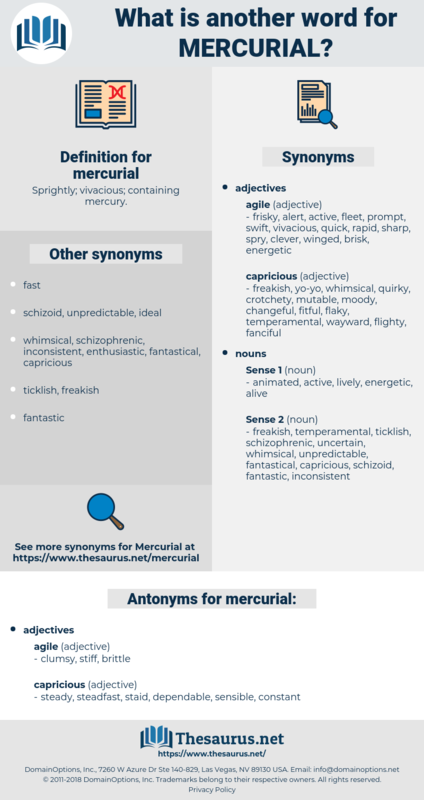 easy, insensitive, laid-back, easy-going, passive, uninspired, unexcitable. unchangeable, calm, unperturbable, unvarying, tranquil. permanent, uniform, trusty, tried and true, durable, tried, persistent, abiding, even, immutable, true, trustworthy, invariable, equable. But you're such a mercurial creature that you'll probably wake up tomorrow morning with your soul steeped in indigo. In some countries the notion was carried still farther by an insistence upon frequent changes in the fundamental law or in the actual form of government, not so much to meet imperative needs as to satisfy a zest for experimentation or to suit the whims of mercurial temperaments.